Bangladesh bested Ireland in the first match of the Ispahani Tea One Day International (ODI) cricket series in Mirpur, Bangladesh. Shahriar Nafees struck a fluent unbeaten 90 while Mohammad Ashraful signalled his return to form with 64 not out as Bangladesh avenged their 2007 World Cup loss to Ireland with a convincing eight-wicket win in Mirpur. More importantly for Bangladesh, it was their first ODI victory after a run of 14 losses and the under-fire Ashraful's first as captain. Bangladesh were off to a blazing start with Tamim Iqbal blasting two successive boundaries through the covers off seamer Kevin O'Brien. Nafees, after picking a couple of runs off the first delivery that he faced, cut Dave Langford-Smith past point to get his innings going. Langford-Smith drew first blood for Ireland in the fifth over, as Tamim sliced the ball to Greg Thompson at point. Nafees did not let that affect his intent, striking three fours in a single over bowled by Langford-Smith, who, despite an early wicket, struggled to maintain a consistent line. This was a much needed win for the Tigers following a disappointing showing against South Africa earlier this month. The two countries return to Shere Bangla National Stadium on Thursday for the second in the three match series. This victory should come as both a relief for the Tigers as well as a matter of pride. In the 2007 Cricket World Cup, Ireland eliminated Bangladesh in the Super Eights round after a series of impressive Bangladesh victories. Defeating Ireland so soundly yesterday had to feel good. As I wrote before, the best Bangladeshi food is homecooked. For us bideshis, though, it's not always possible to get an invite to dinner when you're craving a hearty Bangla meal. So, we break out the turmeric and the garam masala and we get our hands a bit dirty. Yesterday afternoon I spent a couple of hours cooking up a Bangladeshi meal as best I could. While I've improved much over the past couple of years, my plates still leave me longing for the food from Nazma and Dilnasheen's kitchens. 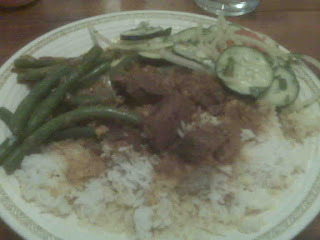 I put together a plate of rice, green beans, lentil, curried beef, and cucumber salad. Lest anyone mistakenly think my curry powers are more than they are, I must admit that I used a Radhuni packet for the curry sauce. But, this meal turned out to be pretty good. Mustard oil, I am increasingly convinced, is the key. Why Americans don't cook with it is utterly beyond me. This sort of meal is entirely cookable. If I can do it, so can you. I have yet to find a good Bangladeshi cookbook in English, but if you look online you can find quite a few good recipes. And if you can read Bangla, you'll be set. While this is a fairly easy meal, some of my other attempts at Bangladeshi cooking have been disasterous. I am assured that shami kabobs (small spicy patties made from meat or fish mixed with lentil) are quick and easy. But I've spent hours, only to end up with a greasy soup of spoiled meat. I once managed to get something resembling a shami kabob to come out of the pan, but it was a far cry from what you'll get in a proper Bangaldeshi kitchen. My dinner was good, though it still needs a bit of improvement. If I could get some decent Ilish fish, it would make my day. But the food is getting closer, and that's what counts. Perhaps, Mr. Ekram Kabir, someday I will be best radhuni! Bangladesh has great food. There's just no two ways about it. 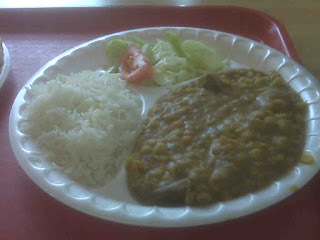 The problem, however, is finding great Bangladeshi food in the United States. It can be done, but it's not easy. The best way, of course, is to get an invitation to someone's house. Bangladeshi food is best homecooked, but as that's not always an option, we're left to look for a good restaurant. Sadly, many Bangladeshis in the United States operate restaurants that specialize in toned-down, Americanized versions of Indian cuisine. I've asked why this is, and the answer is always the same. With a shrug, the restaurateur will simply tell you, "that's what Americans like. Nobody knows Bengali food." And so we search on for the restaurant that caters not to bland American palates, but to experienced Bangladeshi ones. Your easiest bet is in a big city like New York or London, where well established Bangladeshi neighborhoods like Jackson Heights and Brick Lane support a multitude of shops and restaurants that import home to the local Bangladeshi community. One important note - remember that when you're visiting a Bangladeshi restaurant in a Bangladeshi community, you are a guest. Behave like a gracious one. After careful research, and some asking around, I finally found a good Bangladeshi restaurant near me. It's not actually in the city, but about an hour by train and bus. Not somewhere I can eat every day, but somewhere that's well worth the trip on a Saturday or Sunday. 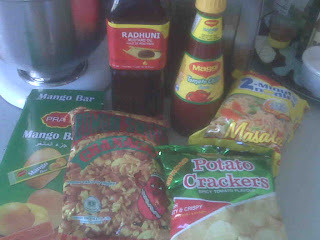 After lunch, I walked next door to a Bangladeshi grocery where I picked up some essential groceries - chanachur (snack mix), mango bars, curry noodles, mustard oil, chili catsup, and potato crackers. Now, if you'll excuse me, I'm going to make some চা (tea).